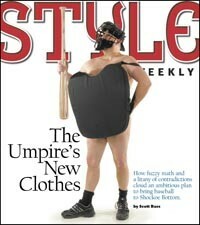 The Umpire&apos;s New Clothes | Cover Story | Style Weekly - Richmond, VA local news, arts, and events. How fuzzy math and a litany of contradictions cloud an ambitious plan to bring baseball to Shockoe Bottom. In times of despair, messages of hope can lift the spirit and offer respite from seemingly insolvable problems. Or they can elicit eye-rolling, pugnacious disdain. On any given night, depending on the civic association or community group receiving the message, the developers pitching a new ballpark in Shockoe Bottom can do either, or both, sometimes at the same time. They preach the need for Richmonders to think bigger and better, reject the defeatism that plagued 6th Street Marketplace, the Canal Walk and the money pit that is the Greater Richmond Convention Center. They ask for trust and support for a plan that promises millions of dollars in tax revenue, a regenerated downtown that will bring families together and an infusion of $318 million of private capital into a section of the city blighted by floods and empty parking lots. It requires a deep-seated, religious-like faith to believe that a new ballpark for a team that doesn&apos;t exist can save downtown and become an economic catalyst for retail development, condos and new office buildings. You must turn a blind eye to decades of Richmond history and contrarian evidence, the almost-universal dismissal by academics that sports stadiums are economic generators. And for it to happen, the city must not only support the project, but also surmount its worst recession in 75 years by 2013 and entice a largely suburban region rooted in white flight to overcome its aversion to downtown. Paul Kreckman, a tall, graying Southerner with a soft, deadpan delivery, understands the obstacles all too well. But the vice president at Highwoods Properties, the project&apos;s master developer, says he believes it&apos;s worth a shot. “This is the season of change, I guess, or whatever you think of that,” Kreckman tells a packed cafeteria at Linwood Holton Elementary School. As for the change agents, they&apos;re striking contrasts in style, personality and, well, height. Bryan Bostic, in charge of the baseball ownership group and Kreckman&apos;s partner, is easily a head shorter — a stocky, neckless man with a reddish hue who tends to speak in bitingly short, distended sentences. “Big numbers. Very successful. Why not here?” he implores. Tears are streaming down the faces of children, he tells those gathered in the cafeteria. With a new team to replace the Richmond Braves, “we&apos;re going to see those smiling faces again.” Bostic is negotiating with a team that he can&apos;t name — minor league baseball requires confidentiality — but he says this new team will “bring people back in droves.” The best part? No city funds or tax dollars necessary, he says, flashing the thumbs up. He bubbles over with agitated excitement when talking about the economic impact that other stadiums have had on their cities. Places like Louisville, Ky., Memphis, Tenn., and Dayton, Ohio, which built downtown ballparks and watched as billions in private investment poured in around them. “If you extract the ballpark out of the Boulevard, it comes to life,” Bostic tells the crowd, largely made up of North Side residents who support keeping baseball where it is. Just look at what happened at other forward-thinking cities such as Memphis, Bostic says. “Two billion, two billion, billion, two billion, two billion in private investment,” he says, fumbling with the mic. The idea has been around for a while, and it&apos;s nearly identical to the first plan floated four years ago by another group of developers, which also included Bostic. They proposed building a new ballpark for the Richmond Braves in a $330 million retail, office and condo development in Shockoe Bottom. But unlike before, Kreckman and Bostic are on a fast track, with deadlines looming, which leads to a sometimes-bumbling, unorthodox routine that often leaves citizens with more questions than answers. For all the big promises and big numbers that the development team members have flashed on PowerPoint slides, they offer very little by way of specifics. The plan calls for more than $90 million in retail sales, yet they don&apos;t know who or what kind of retailers will come. They claim the ballpark won&apos;t cost the city a dime — that the Richmond gets a new ballpark “for free” — but offer few details on how they plan to do that in the current financial crisis. They promise new office buildings, a hotel, condominiums and several multimillion-dollar restaurants, yet there&apos;s no list of who, how much or when. Will the residential demographics and the regional market support the $318 million Shockoe Center? Absolutely, they assure, even though they&apos;ve produced no market analysis or demographic studies. “The only studies that we have done … look at the success of other communities that were in a very similar situation as us with a similar demographic profile,” Kreckman says. The idea that downtown ballparks are economic generators is largely refuted by the academic research on sports facilities. The problem with these proposals, says David Swindell, professor of public policy at the University of North Carolina at Charlotte, is that they often require city officials to get into bed with developers before doing any significant due diligence. Bostic doesn&apos;t want to hear it. He says there&apos;s a mountain of data that shows downtown ballparks becoming major generators of private capital and economic spinoff. Take Memphis: The developers who built AutoZone Park for the Memphis Redbirds in 2000 have seen a 33 percent spike in residents moving into the area, Bostic says, in addition to the $2 billion in private investment around the ballpark. There&apos;s no shortage of praise from civic boosters in Memphis for the new ballpark and all it&apos;s done for the city, reviving a blighted downtown area once the domain of adult bookstores. But it&apos;s difficult to understand how ballparks can be catalysts in one location but barriers to development just a few miles down the road. Removing The Diamond from the Boulevard “unlocks” that area&apos;s economic potential, Bostic says. “If we leave the Diamond there, what economic development has built around it?” Bostic poses to a gathering of 4th District residents at St. Luke Lutheran Church Feb. 3. A ballpark in the Bottom will transform into an economic catalyst, Kreckman says, and without it the rest of the development isn&apos;t possible. “Without the ballpark, we don&apos;t get the private investment,” he tells the St. Luke crowd. “There is a whole host of land-planning issues that get all tangled up in trying to redevelop the Boulevard,” Kreckman tells Style Weekly. Where do you put the new stadium? For example, he says city officials informed him that relocating the city&apos;s public maintenance facility to make way for a ballpark would cost the city too much. There are parking issues there, too. A ballpark in Shockoe Bottom could use multiple city and state-owned parking decks on game nights. The Boulevard would rely on surface parking lots, Kreckman adds, tying up valuable acreage that could be better used for retail shops or other development. For all the unanswered questions dogging the Shockoe Center proposal, there&apos;s considerable study and research behind it. It&apos;s just that most of the work was done more than five years ago, when a group of local businessmen first floated the idea for a new ballpark instead of a planned $18.5 million renovation at The Diamond. The Richmond Braves were poised to sign a 10-year-contract to continue playing baseball at The Diamond in fall 2003. The group effectively nixed The Diamond renovation plan and piqued the interest of the Braves. The effort was led by a group that later became known as the Richmond Ballpark Initiative, which hired the architecture and design firm of Looney Ricks Kiss, which designed the Memphis ballpark. From those studies, Shockoe Bottom emerged as the best site for baseball, despite its somewhat isolated location. The problems with drainage, however, emerged a year later when Tropical Storm Gaston ripped through the area in August 2004, depositing its worst damage along 17th Street, just south of the proposed ballpark site, which at the time seemed to deep-six the proposal. The plan came roaring back in February 2005, when the Richmond Braves announced a partnership with Washington-based Global Development Partners, which was proposing a grand fix: a $330 million mixed-use development in Shockoe Bottom anchored by a new ballpark for the Braves. At the time, Kenneth Powell, the state&apos;s guru of tax-increment financing and community development authorities, which allow counties and cities to create quasi-governmental entities with taxing authority to float municipal bonds that remain off the jurisdiction&apos;s books, proposed an $80 million bond issue that would be paid for with incremental real estate, sales and other taxes generated within the $330 million development. That proposal four years ago also promised not to cost the city a dime. But there is a key difference, Powell says. The plan was for those bonds ultimately to be guaranteed by the private development that enveloped the ballpark. “If that revenue is enough to pay the bonds, then that&apos;s fine. If that&apos;s not enough, then we drop back to a backup special assessment,” Powell recalls of the proposal. The backup was an additional real estate tax assessment levied on the private property owners within the ballpark district. If all else failed, the deal was to leverage a portion of the $330 million private development in the form of property liens that the bondholders could exercise if the planned tax revenues, and the special assessment, failed to cover the bond debt. In other words, private property owners within the tax district were the last line of collateral. If the bonds defaulted they&apos;d lose their shirts. Powell also informed Global Development and the Braves that the bonds couldn&apos;t be issued until the project&apos;s construction financing was secured, and the developers had 50 percent of their leases signed. Without it, there was no way that big institutional investors would purchase the ballpark bonds. Powell officially proposed a community development authority, with the ultimate guarantee coming from the private investors who proposed building the $330 million ballpark. But that deal died in the political crosshairs of Mayor Wilder. Late last year, Wilder decided differently, and publicly endorsed Highwoods Properties proposal to redevelop Shockoe Bottom with a ballpark. But Highwoods&apos; timeline — to get the city&apos;s approval by Aug. 1 and float the bonds later this year — have struck some as overly ambitious considering the state of the economy. Powell says the credit crunch essentially nixed all deals in Virginia in 2008. His firm, Stone & Youngberg, which specializes in public finance, has 21 similar community development authority projects across the state waiting in the pipeline to secure construction financing and hit the bond markets. Kreckman says the Highwoods plan isn&apos;t an official community development authority like the one Powell put together in 2005. Instead of using taxpayer money and creating a community development authority, he says his group plans to issue nongovernment revenue bonds instead. He says there&apos;s a difference. “We are not proposing a CDA. The CDA leads to raising people&apos;s taxes and going outside the boundaries,” Kreckman says. “[The ballpark] will be a publicly owned facility. The bondholders can only look to the revenue streams within the park and the revenues within the ballpark itself.” If that&apos;s not enough, Kreckman says, the bonds simply won&apos;t sell. But that&apos;s where the differences end. Both Bottom proposals require the city to grant the developers taxing authority, and siphon off tax revenues generated by the project in the future to pay off the bonds. What if those revenues aren&apos;t enough to cover the bond payments under Highwoods&apos; plan? The biggest sources of revenue include redirecting 2.5 percent of the state&apos;s sales tax generated by businesses within the tax district and the city&apos;s 6-percent meals tax. Kreckman says the ultimate collateral for the bondholders will be the ballpark itself, presumably meaning the bondholders would take ownership of the ballpark and sell it off to cover the debt if the deal falls apart. But it&apos;s difficult to see how the ballpark will be enough of a security blanket for the bondholders. Unlike other commercial properties that retain value even after leases expire, the ballpark is a one-trick pony. If the baseball team leaves, and there&apos;s little development around it, what would the stadium be worth? Sources say it certainly wouldn&apos;t be worth the $60 million it will cost to build it. The $70 million bond issue includes money for a proposed concourse, which doubles as an escape road if the area floods, a reserve fund and other fees related to issuing the bonds. There&apos;s one other little detail that raises even more questions. Kreckman says the ballpark and the concourse become public facilities, which means they are owned by the city. If the bonds fail and the bondholders come to claim the new ballpark, and it&apos;s not enough to cover the debt, where does that leave the city? The answer to that is still unclear, even to city officials studying the proposal. But that&apos;s unlikely to happen, of course. Kreckman and Bostic are so confident that their plan will lure hundreds of millions of dollars in private investment and bring families from the suburbs back downtown, that they routinely ask people how they would spend an additional $3 million surplus they say the project will generate for the city. The revenues will be so strong, they say, that they forecast the bonds being paid off early and kicking back millions in excess revenue to the city to spend on schools, police, roads — whatever residents can dream up. “How do you want to spend that $3 million in your community?” Kreckman asks the St. Luke crowd. But there&apos;s little evidence that the excess revenues generated by the project — if the project goes off as planned — would actually be excess revenue for the city. It goes back to the question of whether sports facilities can become economic catalysts. The extra $3 million promised by Kreckman and Bostic doesn&apos;t take into account one of the most basic deficiencies that economists look for when studying the economic impact of sports facilities: the substitution effect. In other words, if a family of four heads to the ballpark for a night out and spends $50, economists say that often means the same family isn&apos;t spending that money somewhere else. The same theory should be extended to the rest of the $318 million Shockoe Center, which would be paid for largely with tax revenues generated by the project. For example, to achieve the planned $8 million in annual tax revenue that Highwoods expects to generate within Shockoe Center — about $5 million to make the bond payment and another $3 million in surplus revenue — they would need to produce more than $90 million in retail and restaurant sales each year. It will, Kreckman says. The project will draw people back downtown and the city will be able to recapture sales that are exclusive territory of the suburbs, he says. He&apos;s convinced Shockoe Center will become a regional draw. Admittedly, he also says Highwoods hasn&apos;t performed a detailed market and demographic analysis or conducted any surveys to gauge suburban interest in regularly visiting a Bottom ballpark. Considering how the Shockoe Bottom proposal has split Richmonders, sometimes passionately, the project first must pass the smell test with city residents. That won&apos;t be easy. Many residents are worried not only that suburbanites won&apos;t come back for baseball, but also that the city will be left holding the bag if the deal falls through. At St. Luke Lutheran Church, situated just off Chippenham Parkway, the nearby residents get restless when Bostic reiterates that the taxpayers, the city, pays nothing and ultimately gets a new ballpark. “They get it for free,” Bostic says, seeming to grow frustrated. Nick Valdrighi of the 4th District, who&apos;s been fidgeting in the pews most of the night, stands up and questions the logic. “Have you ever heard that there is no such thing as a free lunch?” he asks Bostic. “All the time,” Bostic fires back. In a city that&apos;s seen so many promises go unfulfilled, that may wind up the toughest sell of all. Kreckman says he&apos;s ready to make the sale.